The Closing of Lisheen Mine – by Brian Quaid & Stephen Wheston. Another chapter in Tipperary's Metalliferous Mining History comes to a close. On the 31st of December 2015, the main underground water pumps were switched off at the Lisheen Mine. Thus began the final phase of the closure of what was once Europe’s largest zinc producing operation. Lisheen Mine has been a part of Ireland’s metal mining history, which stretches back to the Bronze Age when copper deposits were worked on Mt. Gabriel, Co. Cork ca. 1500 BC. 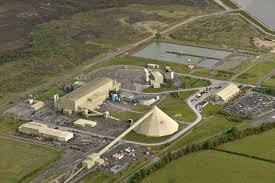 Since then ores of iron, gold, silver, copper, lead and zinc have been extracted at various locations throughout the island, and Tipperary has itself played a major part in Ireland’s base metal mining history with Silvermines being first mentioned in "Irelands Natural History" of 1645. Indeed there is reference to mining activity in the region from as far back as the 10th century by "Danish miners", but the first documented workings are dated to 1604 and mining continued on and off in the area until 1870. Again between 1949 and 1958 efforts were made at extraction of the known mineralisation but falling metal prices forced cessation of activity. The Modern Irish Mines, as they are often called, have strong links to Canadian exploration companies who had great success in Canada, and miners with Irish roots sought to use their expertise to prospect in Ireland. With the application of modern exploration methods, a large zinc-lead orebody was discovered at Silvermines, the published reserves being 17.7 million tonnes at an approximate grade of 8.9% (Zn + Pb). This was in many ways the start of modern mining in Ireland. The provenance for zinc in Ireland is significant and, although Ireland is not considered a "mining country", the known deposits contain some 14 Mt of zinc metal, approximately 1.5% of world zinc found to date. Ireland is ranked first in the world in terms of zinc discovered per sq. km, and second in the world for lead discovered per sq. km. 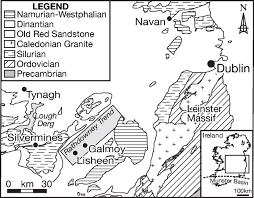 It is therefore not surprising that interest in base metal exploration has continued in the Irish carboniferous limestones throughout the 1970’s, 80’s, 90’s, 00’s and up to the present day. The discovery of the Lisheen orebody can be attributed to a number of earlier discoveries along what is known as the Rathdowney Trend. This geological trend of altered limestone stretches from Abbeyleix, Co. Laois to Holycross in Co. Tipperary. Interest in the area between the villages of Templetouhy and Moyne was initially due to mineral showings on the trend at Derrykearn, Tonduff and, most notably, the Galmoy orebody. Galmoy was discovered in 1986 by Conroy Petroleum. On news of this significant orebody, the Chevron Mineral Corporation took out prospecting licences to the north-east and south-west of the Galmoy block. Drilling began in 1990 in the vicinity of a weak soil geochemical anomaly to the west of the Moyne-Templetouhy road. Several diamond drill holes were sunk with encouraging results, but no intersection of ore grade mineralisation. However, on the 3rd of April 1990 in hole 3262-1 zinc-lead mineralisation intersected with an overall grade of greater than 35% zinc and 6% lead. This was the beginning of a story that has lasted almost 27 years. Initially the Chevron Mineral Corporation and Ivernia West entered a joint venture project to fully delineate the orebody. In 1993 Chevron decided to sell its share to Minorco (a subsidiary of Anglo American). Exploration continued along with environmental impact studies and planning applications prior to the first ground being broken in 1998. At this point three distinct ore zones had been outlined, namely the Derryville, Main and North Zones. The company engaged the services of contract mining firm Cementation, who carried out all the initial development mining to access the orebody. An inclined roadway was driven from the mine plant site in Derryfadda westwards towards the main zone. This ramp, at a decline of 15%, would provide personnel access underground and allow heavy mining equipment to be driven from the surface to the mining areas. The decline would also allow ore to be brought to the surface via a 1.5 km long conveyor belt system. A vertical shaft was also sunk in Killoran townland. This was known as the Fresh Air Shaft (or FAS) and would supply clean air to the mine workings and also provide an emergency means of egress. In sinking the decline there was an initial setback when a large water bearing feature was intersected which temporarily halted progress. This hurdle was overcome through the technical expertise and hard work and dedication of all concerned. 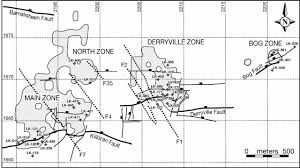 In September 1999 the first ore was mined in the Derryville Zone, followed shortly after with ore from the Main Zone. As the mine settled into its main production phase, numerous issues arose, as with any mine. These included poor ground conditions, water ingress and the rolling nature of the orebody itself. All of these obstacles were overcome and in 2001 the first million tonnes of ore hoisted to surface was recorded. On the surface a dedicated team were hard at work in the mine concentrator, where the raw ore was milled and separated into the finished products of zinc and lead concentrate, ready for transport to the port of Cork for onward shipment by sea to an international list of smelters. Lisheen ore was sold to buyers from Europe, America and the Far East. In 2012 Anglo American decided to divest itself of its zinc and lead operations. This resulted in the sale of Lisheen Mine to the Indian multinational Vedanta. With Vedanta’s backing the underground workings expanded further and the new island pod was accessed via a kilometre-long drive through limestone rock. This new reserve, along with the purchase of ore from the Galmoy mine, helped to extend the life of the mine from 2013 to 2015. At the time of writing, the mine is well on target in its mine closure plan. This has involved the capping of all entrances to the underground workings, the dismantling of the concentrator building and surface stockpile store known as the Teepee, the removal of all foundations and associated material, and the placing of this material into the Tailings Management Facility. There has been an ongoing capping (or progressive rehabilitation) of the Tailings Management Facility, and to date approximately 74% is capped and rehabilitated to farmland pasture. Lisheen also met the commitment that it made to the community and other stakeholders to rehabilitate 60% of the TMF before mining operations ceased. The process will see the TMF fully rehabilitated by the end of 2017. There remains on site a small Lisheen Mine closure team involved in the final wrapping up of the various aspects of the operation in conjunction with civil engineering contractors. Throughout its time of operation, the mine has employed over 350 people directly along with numerous contractors and consultants. There has also been a significant knock-on effect in its hinterland in terms of local businesses and community gain. It is easy to think of a mine as a group of miners drilling, blasting and mucking ore; however the underground staff were only the tip of the mining iceberg. The following is a list of the professions that have worked together to make the Lisheen Mine the successful project it has been for the last 18 years of operation: miners, plant fitters, mechanics, store men, pump men, crusher operators, electricians, grade control technicians, shotfirers, shift bosses, mine captains, mine services operators, shotcreters, carpenters, geologists, planning engineers, mining engineers, mine rescue staff, safety reps., health and safety officers, mill operators, metallurgists, analytical lab staff, environmental staff, geotechnical staff, accounts staff, administration staff, cleaning staff, security men, transport staff, purchasing staff, facility maintenance staff, ventilation staff, IT staff, marketing staff and senior management staff, not forgetting the staff at corporate level who placed their trust in the Lisheen people to execute a safe and productive operation. An outplacement programme was established two years prior to cessation of operations, and this programme provided courses and advice to all employees to prepare them to transition into their next employment. While a number of employees were at the age where retirement was the most attractive option, most others have moved seamlessly into new jobs. While a number are now working in Tara Mine and other mines overseas, many others have transferred into high-tech industries such as pharmaceutical and medical devices. Over the life of the mine we have seen many people come and go. Friendships were made with workers of many nationalities: South African, American, Chilean, German, Spanish, Welsh, Scottish, English (and Cornish! ), Peruvian, Australian, Polish, Columbian, Canadian and of course Philipino. Employees were developed over the years: from graduate engineers who have gone on to manage multimillion euro projects to leaving cert graduates who became electricians, fitters and accountants. All employees earned wages that paid for houses and raised families, bringing value into communities all around Lisheen. And while we had babies born to employees, we also had sad times with the passing of dear friends and colleagues. May they rest in peace. The primary closure objective at Lisheen has been to restore the mine site. However, Vedanta and Lisheen management have a vision to attract replacement industry to our site to provide replacement jobs and sustainable growth. A task force has been in place for over two years to try and realise this vision. The task force is made up of ex-employees and members of local government and industrial development agencies. The vision for the site is to establish a ‘Bio-Economy Campus’ with multiple operations and jobs. Tipperary County Council successfully achieved one of the six European Model Demonstrator Regions for the bio-economy, and Lisheen is at the hub of the Irish region. This classification secures advisory support from the European Sustainable Chemicals Support Service, with access to economic and policy expertise and industrial networking, and provides a strong lobbying tool for Lisheen and potential tenants. So while the site looks to the future, we certainly can’t forget our past. Through all the good times and the difficult times friendships were forged that will be as enduring as the metal that was produced. There was a pride and level of professionalism at Lisheen which ensured that work was carried out to the highest standards. Lisheen has improved the lives of its entire workforce and provided all with the education and skills to ensure they can continue to provide for their families long after the mine is closed. A positive legacy has been left behind in terms of the sporting facilities and community halls that were sponsored by the mine, and above all by the responsible operation of the mine which ensured that there would be no negative impact on the environment when the mine was closed. The rehabilitation of the tailings pond is being seen as an exemplar for the rest of the industry. Brian Quaid & Stephen Wheston - March 2017.